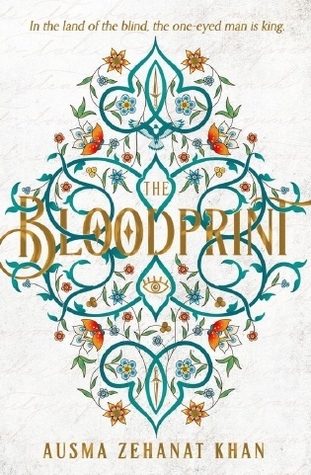 Title: The Bloodprint Author: Ausma Zehanat KhanPublisher: Harper VoyagerRelease Date: October 19th 2017Synopsis: In the lands of Candour, the Talisman threaten the authority of the Council with their growing indoctrination of the masses based on their rigid, oppressive interpretation of the Claim; a text orally transmitted from generation to generation, which they have appropriated in order to gain power. Tasked by the Council to fight this is Arian, aided by companion Sinnia and young boy Wafa, who must find the Bloodprint, legendary manuscript the Claim is based on, in order to stop the Talisman and re-establish the truth. Review: I hate reading slumps. I get into one every now and then where I find myself wanting to sleep on the bus rather than read and that affects my connection with a book. So I came into this with a slow burn, but as my last tweet indicates, a spark that grew and grew. This book laid the foundations for a developing growing world story well, covering politics, religion, friendship, loyalty and love and more importantly how all are interweaved. Magic is always interesting to look at in a book, and this was quite an intriguing system, because it was less spell-craft and more about the power of religion as a force to be reckoned with. The Claim was poetic, beautiful and all encompassing and more importantly something that was known and interpreted differently by everyone. This made it felt very topical whilst reading it and it is something I feel will be explored deeper over the books. What we saw here was how such a strong belief can be chipped away at, questioned and used in a way that you didn't understand. Religion as a power was also a great way to open the conversation without having to blatantly lay it out on the table. What shone for me here was the pride in the characters. Sometimes this can be a negative but here I feel it really worked. Oralist's I feel would be proud, I felt an independence and a dignity to both Arian and Sinnia, though they used this independence in very different ways. Their friendship was strong but an interesting balance where throughout the novel they are pitted against each other. I was looking at other peoples views on this and someone saw this as a negative, but for me his was a realistic dynamic and something I feel we have all experienced. I know for sure the way I view myself is definately pitted against other people i know and I try to play up to certain situations so I feel I am noticed the way Sinnia did. I wanted to hug her at these points. But she'd more than likely shake me off. The Silver Mage, and he can only be called this because it gives him the level of grandeur that I feel he deserves, has this regality and dignity but in a completely different dynamic to how I saw Arian and Sinnia. You felt the fire of their relationship and though at times it became a little repetitive, it reestablished the connection that they had and were fighting against. it brought it back to the hart of the story which was about the power of relationships and what we sacrifice for them. And Waffa dear Wafa, from a character I didn't think I'd love to one the book you couldn't do without. Every book needs a Wafa and I hope he develops into this amazing leader of a man in the coming books. As with a series the book left on a cliffhanger which is soooo infuriating because this tension builds and build and hit this climatic point and you don't know what to do with all that energy. But I NEED TO KNOW WHAT HAPPENS NEXT, you can't just leave a book like that. Until we meet again.